Featuring in-field demonstrations of equipment and discussions with speakers and growers. Rotate between 3 demonstration/discussion stations in the morning, 3 more in the afternoon. 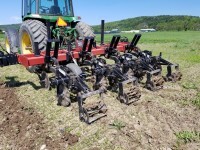 Topics include: roller-crimping, zone tillage in high residue, in-row cultivation tools, stale seedbed and weed seed bank management strategies with an overall focus on soil health. Free to the Public, Lunch included!